The Encyclopedia Britannica is ceasing publication of its print, dead-tree edition and will continue with just their digital online edition. I know in my head this is progress and probably makes economic sense for both consumers and Britannica but in my heart? I will miss the 32-volume printed edition that I haven’t laid eyes on in years, collecting dust in boxes in a closet because my set is as outdated as me. I even remember as a very young child learning how to spell encyclopedia from Walt Disney’s Jiminy Cricket via some goofy sing-songy bit on the after school Disney show. I couldn’t read yet, but I could sing/spell encyclopedia. The Encyclopedia Britannica has been around since 1768, and was first published in Edinburgh, Scotland. A new set costs $1400, and it seems they have had plenty available in their warehouses these last few years. I don’t know if ceasing publication will drive the price up of used sets, think of the shipping costs of buying a set on Ebay? 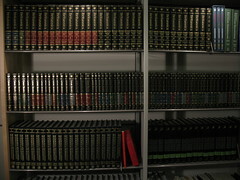 While Britannica has been in the digital world for many years, officials at Britannica said the print edition was just becoming impossible to maintain and keep up-to-date and of course there is the physical delivery of the huge, heavy sets. While they haven’t stated it, with the resources of Wikipedia and Google at your virtual fingertips you would be hard pressed to open an encyclopedia for information anymore, let alone pay a fee for their online encyclopedia. When I was a kid my parents couldn’t afford to buy a set from the Britannica salesmen that rang our doorbell on a regular basis in my Chicago neighborhood and tried to get you to buy them on the monthly plan. My dad wasn’t a monthly plan type of guy, so we used the encyclopedias at the library. If a school assignment called for a paper on Paul Revere, a teacher could expect every kid in class to have the same information, taken from the same big impressive burgundy book, with only vague differences depending on writing style. If you waited until the last-minute to write your assignment, as I often did, you had to wait for hours at the library to get the specific alphabetized book you needed because other slackers were using it. By the time my youngest brother got to school, my folks had a little more expendable income and my brother got his own Encyclopedia Set (the rat). He didn’t have to take the bus to the library as he had his own source materials right at his fingertips. The youngest kid is always spoiled of course and since he was the “brain” of the family he would sit around reading the encyclopedia as his light reading. Who does that? Certainly not my sister or I who only cracked an encyclopedia under intense pressure to perform a knowledge based task. Years later as an adult I bought a used set from a thrift store for next to nothing. I don’t even know why, I just wanted them, I loved books anyway and just liked the way they looked. Maybe I thought having them would make me look scholarly. While I feel bad for employees of Encyclopedia Britannica, I can see that the whole world has gone digital–or will, it’s progress of course, but for us in the older generation it is bitter-sweet. A lot of my memories are tied to old stuff which is why I’m still hanging on to my old Encyclopedia Britannica set, my grandfather’s Kodak Brownie camera, my Sony 8-track, my old LP’s and my record player. If for no other reason than when I am long gone, younger generations of my family can say things like; “Wow, you mean they had to turn pages?” And then find out my old “stuff” is worth a ton of money. Interesting post – I remember going in early before school to get at the books and at the mimeograph machine. There is something that has gone away that I really miss – the smell of fresh mimeo ink. OMG mimeograph machines, I forgot about those!